Jin Zhang is working to develop better materials for solar cells. Photo by T. Stephens. In the race to make solar cells cheaper and more efficient, many researchers and start-up companies are betting on new designs that exploit nanostructures--materials engineered on the scale of a billionth of a meter. Using nanotechnology, researchers can experiment with and control how a material generates, captures, transports, and stores free electrons--properties that are important for the conversion of sunlight into electricity. Two nanotech methods for engineering solar cell materials have shown particular promise. One uses thin films of metal oxide nanoparticles, such as titanium dioxide, doped with other elements, such as nitrogen. Another strategy employs quantum dots--nanosize crystals--that strongly absorb visible light. These tiny semiconductors inject electrons into a metal oxide film, or "sensitize" it, to increase solar energy conversion. Both doping and quantum dot sensitization extend the visible light absorption of the metal oxide materials. Combining these two approaches appears to yield better solar cell materials than either one alone does, according to Jin Zhang, professor of chemistry at the University of California, Santa Cruz. Zhang led a team of researchers from California, Mexico, and China that created a thin film doped with nitrogen and sensitized with quantum dots. When tested, the new nanocomposite material performed better than predicted--as if the functioning of the whole material was greater than the sum of its two individual components. "We have discovered a new strategy that could be very useful for enhancing the photo response and conversion efficiency of solar cells based on nanomaterials," said Zhang. "We initially thought that the best we might do is get results as good as the sum of the two, and maybe if we didn't make this right, we'd get something worse. But surprisingly, these materials were much better." The group's findings were reported in the Journal of Physical Chemistry in a paper posted online on January 4. Lead author of the paper was Tzarara Lopez-Luke, a graduate student visiting in Zheng's lab who is now at the Instituto de Investigaciones Metalurgicas, UMSNH, Morelia, Mexico. 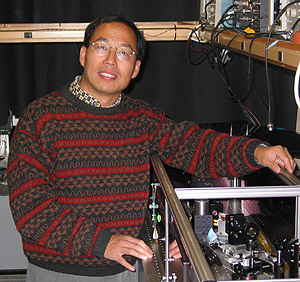 Zhang's team characterized the new nanocomposite material using a broad range of tools, including atomic force microscopy (AFM), transmission electron microscopy (TEM), Raman spectroscopy, and photoelectrochemistry techniques. They prepared films with thicknesses between 150 and 1100 nanometers, with titanium dioxide particles that had an average size of 100 nanometers. They doped the titanium dioxide lattice with nitrogen atoms. To this thin film, they chemically linked quantum dots made of cadmium selenide for sensitization. The resulting hybrid material offered a combination of advantages. Nitrogen doping allowed the material to absorb a broad range of light energy, including energy from the visible region of the electromagnetic spectrum. The quantum dots also enhanced visible light absorption and boosted the photocurrent and power conversion of the material. When compared with materials that were just doped with nitrogen or just embedded with cadmium selenide quantum dots, the nanocomposite showed higher performance, as measured by the "incident photon to current conversion efficiency" (IPCE), the team reported. The nanocomposite's IPCE was as much as three times greater than the sum of the IPCEs for the two other materials, Zhang said. "We think what's happening is that it's easier for the charge to hop around in the material," he explained. "That can only happen if you have both the quantum dot sensitizing and the nitrogen doping at the same time." The nanocomposite material could be used not only to enhance solar cells, but also to serve as part of other energy technologies. One of Zhang's long-term goals is to marry a highly efficient solar cell with a state-of-the-art photoelectrochemical cell. Such a device could, in theory, use energy generated from sunlight to split water and produce hydrogen fuel (see earlier press release). The nanocomposite material could also potentially be useful in devices for converting carbon dioxide into hydrocarbon fuels, such as methane. The new strategy for engineering solar cell materials offers a promising path for Zhang's lab to explore for years to come. "I'm very excited because this work is preliminary and there's a lot of optimizing we can do now," Zhang noted. "We have three materials--or three parameters--that we can play with to make the energy levels just right." In essence, the team has been trying to manipulate materials so that when sunlight strikes them, the free electrons generated can easily move from one energy level to another--or jump across the different materials--and be efficiently converted to electricity. "What we're doing is essentially 'band-gap engineering.' We're manipulating the energy levels of the nanocomposite material so the electrons can work more efficiently for electricity generation," Zhang said. "If our model is correct, we're making a good case for this kind of strategy." Sources of funding for this research included the U.S. Department of Energy, the National Science Foundation of China, and the University of California Institute for Mexico and the United States (UC-MEXUS). Research collaborators included Abraham Wolcott, Li-ping Xu and Shaowei Chen at UCSC; Zhenhai Wen and Jinghong Li at Tsinghua University in Beijing, China; and Elder De La Rosa of the Centro de Investigaciones en Optica, A.C., in Leon, Guanajuato, Mexico. Note to reporters: You may contact Jin Zhang at (831) 459-3776 or zhang@chemistry.ucsc.edu.